Woburn Abbey is one of the 10 Treasure Houses of England, and therefore one of the grandest stately homes in the country. The history of Woburn starts in 1145, when Cistercian monks founded an abbey there. Henry VIII confiscated the property during the Dissolution of the Monastries, and Edward VI granted the land to Sir John Russell in 1547, later to become Baron Russell and Earl of Bedford. His descendants became the Dukes of Bedford, and the 4th Duke constructed the present Classical-style palace in 1747. The interior boast luxurious rooms, Huguenot gold and silverwares, paintings by great masters (Reynolds, Gainsborough...), including the Venetian views by Canaletto (1697-1768). 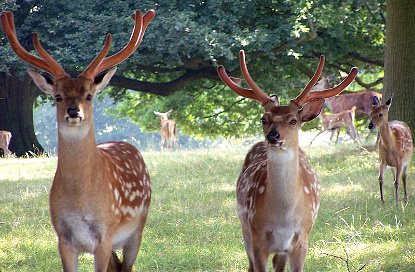 The house is surrounded by by a 1200-hectare park, which counts ten species of deer, including the rare Père David, which became extinct in its Chinese homeland, only to be re-introduced by Lord Tavistock from Woburn stocks in 1985. Woburn Abbey's Antiques Centre was the first such centre to open outside London in 1967, and remain one of the largest in Britain. Like Longleat House in Wiltshire, Woburn has developed its own Safari Park. If Longleat House was the first of its kind, Woburn is now the largest drive-through animal reserve in the UK, and has rhinos, hippos, elephants, zebras, giraffes, antelopes, lions, tigers, wolves, black bears and monkeys. Woburn Abbey is open daily from 11am to 5:30pm (last entry 4pm) between 24 March and 2 October. The grounds and deer park is open all year round from 10am to 4:30pm, except between 24 and 26 December. Admission is £1 (£3 for cars and motorcycles). The Safari Park is open daily from 10am to 5pm (only weekends from Nov. to March), although opening and closing times may be affected by the weather. Admission price also vary depending on the season (Winter/Main/High) and are £8 /14.50/16 for adults and £7/11/12 for children from 3 to 15 years old. Please double-check the opening hours and prices on the official website. 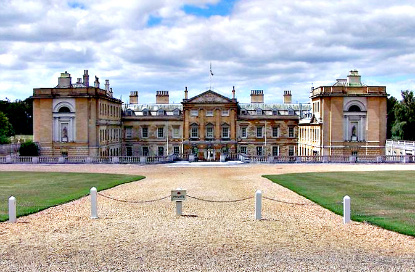 Woburn Abbey is just along the M1 (London-Northampton-Leeds) motorway, about halfway between Luton and Milton Keynes. Th nearest train station is Flitwick (50min from London King's Cross, £14.30), 8km away. You'll have to catch a taxi from the station to Woburn Abbey, as there are no buses.